Members of the Louisville Metro Police Department talk inside a Kroger grocery in Jeffersontown, Ky., following a shooting that left two people dead, Wednesday, Oct. 24, 2018. A male suspect fatally shot a man and a woman at a Kroger grocery store on the outskirts of Louisville, Kentucky, and then exchanged fire with an armed bystander before fleeing the scene, police said. He was captured shortly afterward. Both victims died at the store, said Jeffersontown Police Chief Sam Rogers. He did not say whether police had determined a motive in Wednesday's shooting. He also did not identify the suspect. Police received a call about 3 p.m. reporting the shooting, Rogers said. He said the suspect fired multiple rounds at the man inside the store, and shot the female victim multiple times out in the parking lot. A citizen armed with a gun engaged the shooter in the parking lot, but the suspect was able to flee before he was captured on a nearby road, Rogers said. 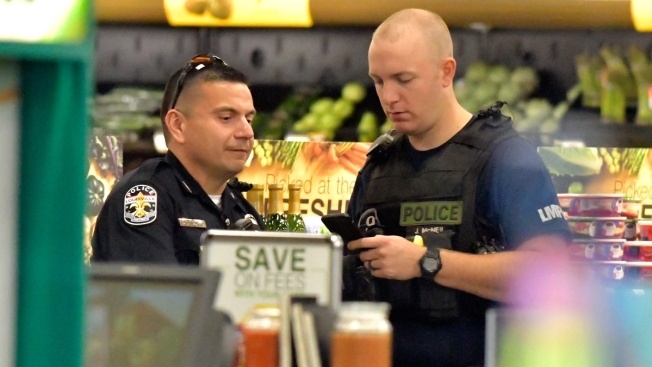 Eric Deacon, who identified himself as an EMT, told The Associated Press that he was in the self-checkout lane of the store when he heard the first shot, in the pharmacy. Deacon said he saw another man in the store with a gun who appeared to be shooting at the suspect, trying to get him out of the store. Deacon went outside and saw a woman in her mid-50s or early 60s who had been hit, and tried to resuscitate her. As police officers swarmed the scene and blocked off the area with yellow crime tape, a man identified by the Louisville Courier Journal as Tim King stood in the parking lot waiting for his wife to come out. He said he drove to the store after she called him sobbing to tell him what had happened. "I said, 'What's wrong?'" King said in a video posted on the newspaper's website. "And she said, 'There's someone shooting up here.'" King said his wife said she heard popping noises, then someone ran around a corner and said, "Oh my God, he's killed her." Customers were moved to the back of the store, she said. "It's just a very, very scary situation," King said. The Kroger Co. issued a statement saying that company officials were "shocked and saddened by the shooting." "Thanks to the quick response of the local police department, the suspect was apprehended and our store is secure."